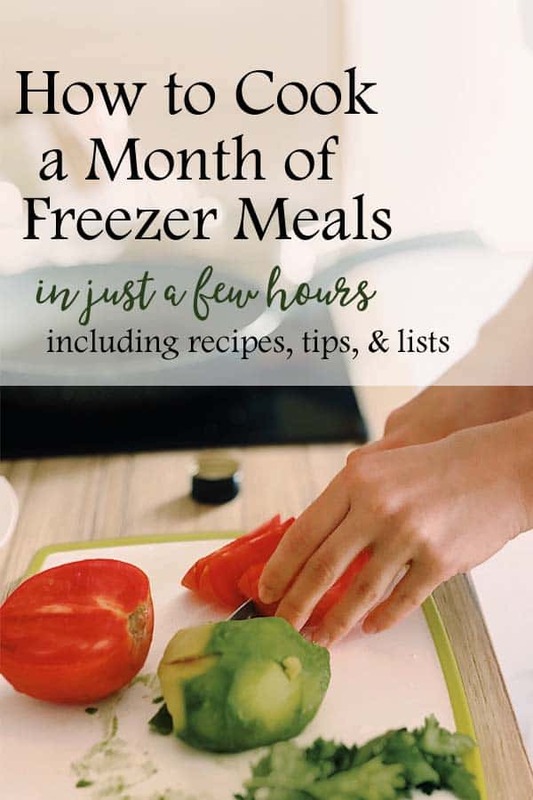 In this article: Learn the simple steps of how to do a monthly meal plan along with over 10 freezer meal recipe ideas. It will save you money and time! It’s no secret that cooking isn’t my favourite pasttime. However, after cooking for my family for 28 years, I’ve learned a thing or two in the kitchen department. My number one time and money-saving tip for the kitchen is to plan meals for an entire month ~ and tuck away as many meals as possible in the freezer. I’ve had requests for details of this process, so I’m going to include it all in this one ginormous post. 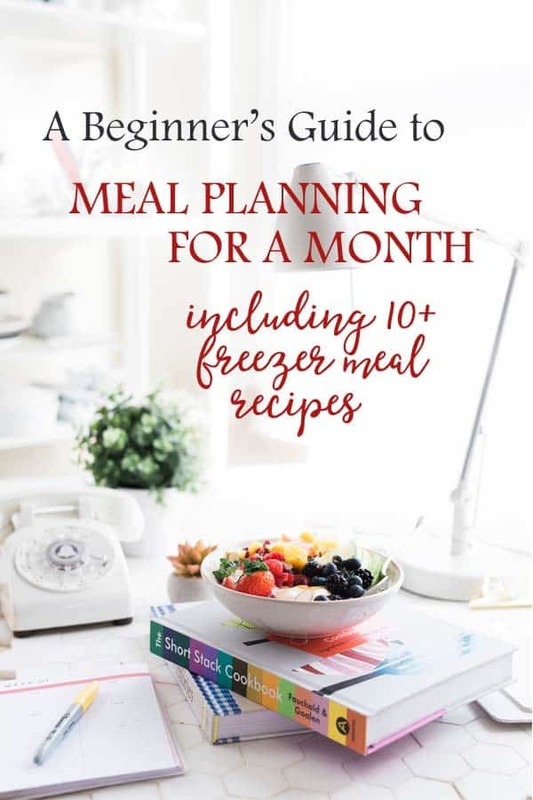 It will be a sort of an “Ultimate Guide for Monthly Meal Planning”. I’ll try to include as many details as possible so you, too, can find the freedom and simplicity of this method. The first step is to sit down with your most trusted recipe books, a big cup of coffee, and plan a menu. Think of things you already enjoy cooking and eating as a family, and put them on a monthly calendar. Unless you really desire to have 30 completely different meals during the month, feel free to have the same meal multiple times throughout the month. I generally have the same meal at least twice. As you are looking for recipe ideas, think of things like soups, casseroles, and meat marinades. A list of my favorite freezer recipes is included below. Once you have your menu planned, go through the recipes and see if you already have pantry (or freezer) grocery items that you will need. This time, I grouped the items for each recipe together and wrote what each group was for. That saved me from buying grocery items I already had. As I put together my shopping list, I categorize items according to the flow of my grocery store. For instance, I make categories like Paper, Deli, Meats, Dairy, Canned, Bakery, etc… and list them in the order that I travel through the store. When we’re in a really big hurry, my husband and I rip the list in half. He starts at one end of the store, and I at the other. We can get done really fast that way! I use freezer bags for most things – soups, marinated chicken, meatballs, burritos, etc. They can lay flat when frozen, and can be labelled easily with a Sharpie marker. Over the years, I’ve collected enough pans to freeze casseroles in like lasagna. However, if you don’t have enough pans, the dollar store has many disposible options at an affordable price. Clean your kitchen, fridge, and freezer. Before you head to the store for your big monthly grocery shop, make sure you can come home to a nice, clean kitchen and appliances. It is so much more efficient to start with everything clean and ready to go! Once you have all your groceries all bought, it’s time for the freezer meal prep to start. Ideally, I like to do this on the same day as grocery shopping (to avoid putting away all those groceries just to take them out again). But, if that’s not possible, it can always be done the next morning. Now that our family is just 2 or 3 of us, the freezer meal prep goes much quicker, but at the time of this original post, I generally divided up the cooking into 2 2-hour cooking sessions. In one, I did all the hamburger meals, and in the other all the chicken meals. But, feel free to play around with the system to find one that works for you. Cook with a helper if possible. I know this isn’t always an option, but after trying many things, my husband and I started doing meal prep together. He enjoys helping, and we found we could accomplish so much more (and quickly) when we worked together. I started by chopping all the veggies for the recipes we were working on. As I chopped away, I made sure I chopped enough of everything for all the recipes we were working on. This month’s recipes included onions, celery, carrots, and peppers. 2 big pots and 2 big burners, we do our cooking in batches based on that. As I finished chopping things, he started adding items together to make the meals for the freezer. While those things were simmering, I put together 2 recipes of Sweet and Sour Sausage. This requires no cooking or heating… Just pop all the ingredients into a big ziploc bag, and it’s ready for the crock-pot. Mark items clearly with a sharpie marker. I like to use Freezer Tape on items. Include in your labelling how to bake the item. I bake most casseroles from frozen ~ covered with aluminum foil for at least half the time. Baking times depend on the item and size of the casserole, but I generally figure baking at 350 degrees for about an hour. Some items from frozen may take longer. For more information on how to cook your freezer meals, check out this post. Soups and other meals for the crock pot are most easily packaged in large ziploc bags. I lay them down flat in a single layer on baking sheets in the freezer until they are frozen, and then they stack nicely in the freezer. Although, we have a chest freezer, I wanted to see if I could fit these all in our fridge freezer. They did…19 meals plus two bags of freshly grated cheese. However, I did rearrange the bags the next morning to make sure they all froze well. This time I timed the process. From the start to the final dish, we worked 2 1/2 hours. Keep in mind, however, that I’ve been doing this for quite a while. I don’t think I was that quick when I first started. love love love… with my schedule, this a NECESSARY weekend project… can't wait to read the rest! Thank you for sharing! Great post (and love those new pins!) Of course, I’m pinning. ;-) Thanks for the tutorial and guide for freezer meals! You’re so welcome! Wish we could do a cooking party together some day! Great post Rita, I have done meal planning for a week and would love to give this a try. I really don’t like cooking, but I sure love the convenience of just pulling something out of the freezer. This has been a lifesaver for us! Great tips! I’m looking to make things easier this year. I literally cook dinner from scratch every night! It’s a lot of work. I don’t have a lot of freezer space, though. I’ll have to work on emptying out our freezer so I can try your method. Yes, it’s amazing how much a fridge freezer will hold if you freeze things flat in ziplock bags. That trick helped us tons! I love the timesaver factor of freezer meals. I plan on taking your advise and do this every month.Thank you Rita! Thanks for sharing these great tips, Rita! I don’t often plan ahead enough but want to do more of this in the new year. It will be a life-saver, I’m sure! We really enjoy it. I hope you will, too! I really need to make freezer meals. Pinning for later.